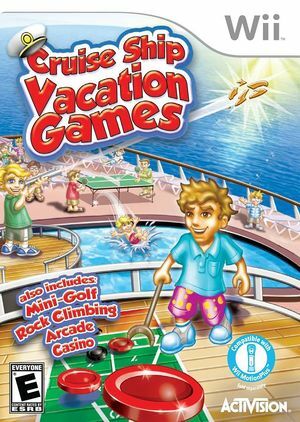 In Cruise Ship Vacation Games (Cruise Ship Resort in Europe, and Holiday Games in Germany) embark on one of three cruise ships and begin enjoying mini golf, driving range, shuffleboard, ping pong, rock climbing, and casino games, all utilizing enhanced Wii MotionPlus controls, and additional trap shooting. Never before has there been so many kinds of games in one package, and you've never played them like this - the added precision control and peripheral integration draws the players further into the game for a more fresh, realistic experience. Journey through multiple locations, upgrading equipment along the way. For many of the games, you'll have the option to play with as many as four people at the same time. Even the card sharks on board a cruise ship are taken care of with a casino containing tutorials of each game. With multiplayer modes in Craps, Blackjack, and Roulette, there is room for everyone at the table. The graph below charts the compatibility with Cruise Ship Vacation Games since Dolphin's 2.0 release, listing revisions only where a compatibility change occurred. This page was last edited on 2 February 2018, at 11:32.